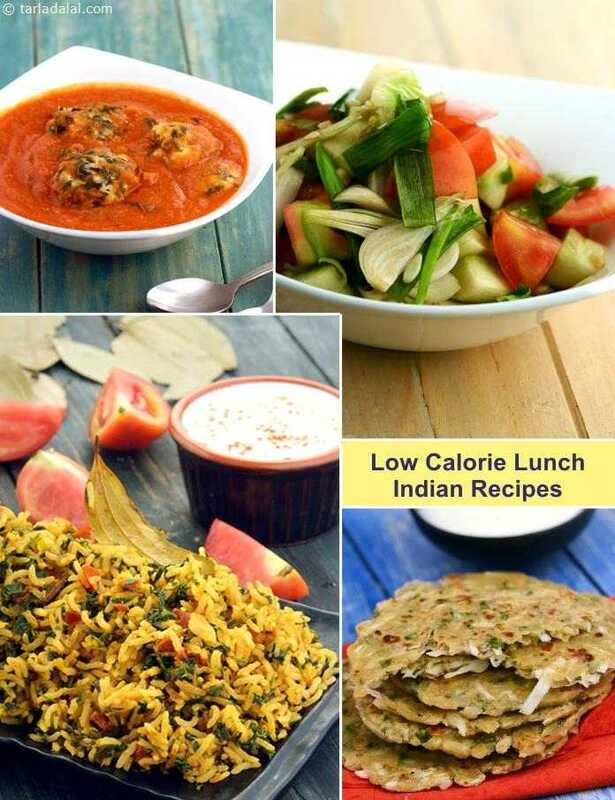 low cal indian lunch recipes collection. Here we bring you a section containing healthy lunch recipes that are good for weight loss. Apart from being low in calories, these recipes are also high in healthy ingredients like nutritious vegetables and free from fatty gravies and high calorie ingredients like ghee, butter. Minimal oil is used as it is a concentrated source of energy. Avoid the usage of corn flour, refined sugars, starchy ingredients like potatoes etc. in making of the recipes. Not everyone is fond of bottle gourd but this Bharwa Lauki will surely make you fall in love with it. The lauki is stuffed with protein and calcium packed paneer which gives it a rich taste, the smooth tomato gravy will add to its rich texture and also the antioxidant lycopene. Rajasthani Style Kaddu Aur Soya ki Subzi is a healthy alternative to the traditional starchy recipe that uses potato. The pumpkins in it not only add to the taste but also give it a nice colour because of beta-carotene which has many health benefits. Another protein packed and low cholesterol recipe is Matki Aur Palak ki Curry which is also high in fibre, vitamin A, thiamine, folic acids, calcium, iron, magnesium and phosphorus. So much to ask for in a single recipe! Make your rotis and parathas nutritious by adding healthy ingredients like green leafy vegetables, paneer and curds. Top-up your protein intake with this flavourful Methi Paneer Paratha, a low calorie paratha which has low calorie ingredients like methi and low-fat paneer. Addition of oodles of oil is also avoided in this unlike the traditional paratha recipes. Don't settle for bland bajra rotis! Feast on these delicious Bajra and Cauliflower Rotis instead. The grated garlic and spring onions really rev up the flavour of these rotis. Bajra Peas Roti is an innovative recipe that in which a combination of stomach-friendly flour with boiled and mashed green peas is used, to get a roti that tastes and feels great. Moreover, one roti gives only 66 kcal, good for diaetics and weight loss. Plan your balanced meals from these low calorie lunch recipes, which are 'smart' rather than just low-cal, and enjoy good health! Stay fit, stay slim! Wish you a happy and healthy cooking experience. Also try our other low calorie categories from below.